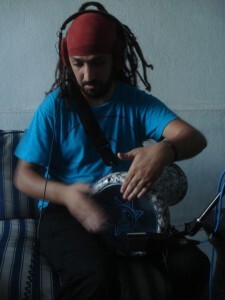 Beyond Digital assembled a free collection of Moroccan percussion loops for use by musicians & DJs. These are high-quality original recordings of Moroccan percussion instruments such as the bendir frame drum, calabash, darabuka hand percussion, kraqeb metal castanets, and taarija. You’ll find grooves and fills played in the style of chaâbi, reggada, and some hybrid rhythms. The material comes from Maga Bo’s recording sessions at the Beyond Digital HQ in Casablanca with Krifart, a percussionist who plays in the local band, Darga. The file names include the BPM – in 4/4. Note: some of these rhythms are in 6/8, but the BPMs reflect the tempo on a 4/4 grid. The loops are dual mono, 16 bit, 44.1 khz and include the respective .asd Ableton Live files. Performed by Krifart. Recorded by Maga Bo. Edited by Colin McSwiggen. Everything was recorded into Ableton Live using an M-Audio Fast Track Pro interface and an AKG 414 microphone. Please use these freely and abundantly. If you do release it, please respect our Attribution-NonCommerical-ShareAlike Creative Commons license, and contact us if you are interested in any use beyond the scope of that.